Guitar strings are the tiny part of the guitar, but it is particularly the most important part that contributes to producing the sound. However, because of being tiny, sometimes, you might forget how essential it is, and you may not pay the considerable attention to choosing it. Thus, I want to show you some of the best electric guitar strings, it can help you to be quick and spend not too much time on finding. You might just need to pay from 5 to 15 $; then you can get the right strings for your guitar. Before coming with the product recommendation, I want to present some information about the confusing terminology around guitar strings such as the material of guitar strings, the string windings, and gauge. If you deserve to know deeply about guitar strings, you must know what materials it can be made of. You should be aware that the acoustic guitar strings and the electric guitar strings are completely different. 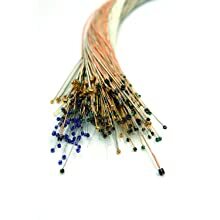 Normally, the acoustic one made of the copper-based alloys(or the combination of copper and zinc) while electric guitar strings made of nickel and steel which are the metal choice. For a six string electric guitar, the three highest string will always be made of plain steel. The lower strings can make of some other materials. For example, Nickel-plated steel which is the most popular material. It offers the great balance between brightness and the mellow warmth. Besides, they can use the pure nickel which is warmer, smoother and rounder than the nickel plated steel. Stainless steel is also the common materials. It will help to produce the brighter, crisper tone. Moreover, there are a lot of other materials such as cobalt, chrome, and titanium. I suppose that you should take the time to consider the string windings. The wound string is the wire that has the wire wrapped around to create the tight spiral. The highest strings are not wound, and the lowest string is the wound ones. We have some wound strings. Most of the electric guitar uses the round wound, but you can use the flat wound which has the same wound with the unwound. However, each winding is more square and sits more flush next to the others and lead to the flat and smooth string. The flat wound strings are more popular with jazz guitarists because you do not mind about the more mellow tone and the best is not important anymore. The guitar string’s gauge is the measure of the thickness. It is measured in thousands of an inch. It is hard to tell you which gauge is the best. It is absolutely up to your favorite and some factors such as your music style or your level or even the guitar that you are using that affect your choices. We found out that the light strings(010 gauges) are the most commonly used gauge by the guitarist, next is the medium strings(011 gauge) and then the super light(099 gauge). I suggest that if you are beginners, you should use the light stings because it is thinner, lighter and easier for your fingers and allow you to fret notes on the fretboard easily. Besides, The beginner has not yet built up callouses on the fingertips. However, it is not the good idea for the professional because of it not much volume, tone and intonation are slightly less stable. Thus, the heavy string will be the best choice for them. 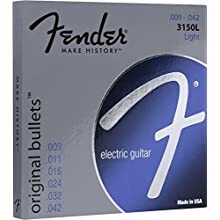 Fender 3150 is the light strings which were got the high rate from customers, 4.6 out of 5 stars. This kind of strings made of pure nickel that brings the smooth feel with reduced finger noise. When using these strings, you will see the rich and warm tone with abundant harmonics. Besides, the Fender’s patented bullet end can produce the sonic coupling between the bridge block and the string for rock solid tune stability as well as increased sustain. Thus, it will be the perfect choice for blues, jazz, and classic rock music. Fender 3150 has been surviving for a long time since 1946. There are many famous artists using these strings for their music. It is more and more change and develops over time about the style, quality. The manufacturer always cares about the detail and finest materials to ensure that the users can get the best feeling and sound strings. You can see the bullet end fits into the Fender tremolo block. Besides, it stays in tune better and resonates more than standard ball-end strings. It is better for those who want to practice, pack up and play in the concerts. However, there are five strings, so it is impossible for the guitar that requires six strings. It would be no matter if you know about this and make another choice. Take a look at the following part; we have four more choices for you so do not be the worry. This product is very well known in the market today. It constructed with nickel plated steel wrap wire which is different from the other type of strings. 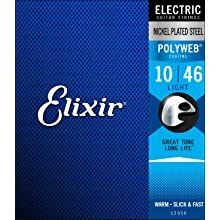 Elixir string coats the whole strings which can protect not only the outer string surface but also the gaps between the windings. Especially, it has the strong, warm, robust tone while the other polymer costing brings the fast and slick feel to play. A lot of users comment that using these strings, their tone lasts longer than any other strings, coated or uncoated. You can play anywhere you want because of the consistent performance and sound. It also can help you to enhance the playability and get the smooth feel on your fingers. It is good for both of recording and performance due to reducing the finger squeak. Besides, one great thing is that it comes with the anti-rust plated steel string that resists the tone-deadening corrosion for making sure a longer life for the whole set. It also has less hassle and expense of frequent string changes so you can have more time for your music than on some kinds of stuff. However, you have to remember that the plain steel 3rd string is not optional for the baritone guitar. And you can, sometimes, get confused with the poly web version. We know that nothing is perfect so you can buy things if you can accept some of its mistakes. I have to say that the D’Addario is the world’s largest manufacturer of strings for instruments. D’Addario can meet all your needs from the amateur to professionals. 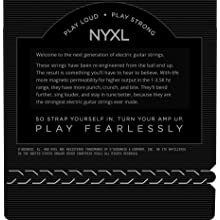 These strings are designed to serve as the critical connection between you and your music. The unwound made of the highly magnetic nickel plated steel to correct specifications. Thus, the strings have the long lasting, distinctive bright tone and the fantastic intonation as well. Nickel plated steel is famous for the unique and bright tone, so it is the industry standard for many genres and playing styles. The unwound strings bring the traditional textured feel most users are get used to and be comfortable with. Besides, these strings are wound with the nickel plated steel on the drawn, hexagonally shaped and high carbon score which is six sides in cross section. These six edge points grip each tune of the wrap wire and ensure the tight wrap and the longer lasting string. The price is not too much high but the corrode is too fast, and it is too light, so it is not the proper choice for those who want the heavy string. This is the second product of D’Addario that I want to recommend to you, so you do not care much about the quality, this product always gets the great attention from the user with 4.5 out of 5 stars. It is made f the high carbon steel alloy for unprecedented strength. Thus, it can improve the tuning stability compared to the others such as some of the traditional electric guitar string. Besides, it can get the tune faster and stay in tune much better. Thi design is famous for bending further, singing louder and staying in tune better than almost any other strings. Besides, the break resistant high carbon steel score and plain steel alloy brings the entirely new level of the power, freedom and the confidence. Moreover, the NYXL provides more strength and 131% more tuning stability. Especially, the wound strings contain the enhanced midrange frequency response in the 1-3.5kHz range that helps to boost the presence and crunch. These strings also offer the ideal combination of flexibility and tone. The price is quite responsible, and the quality is quite good so why do not you buy it? However, some customers complain that the packing looks old, faded and bent. If you are afraid of some drawbacks, you can try to borrow some friends’ guitar with these strings to test before you buy. 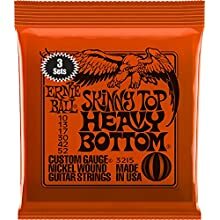 Ernie Ball Skinny is the excellent hybrid set for the person who likes the thick bottom strings without sacrificing the ability to solo on the smaller strings. I can say to you that these strings are precision produced to the highest standards. Thus, it can make sure about the consistency, optimum performance, and the longevity. Besides, the wound strings are made from the nickel plated steel wire wrapped around the hex shaped core wire. While the plain strings are made of the tempered tin plated high carbon steel. Hence, it can produce the well-balanced tone for your best guitar. All the plain string is the series of lock twists which helps to secure the wire around the ball end so it can prevent the slippage and ensure the long lasting string in the minimal break time. Besides, the nickel wound slinky strings can provide the classic and balanced tone with the superior intonation an consistency because of making from the nickel plated steel. Especially, there are 3 individual sets enclosed in the low wrap and single package. However, it can not avoid some complaint from the users. For instantly, they put out is very tiny sound on the single coil pickups. Besides, you have to notice if you have the floating bridge because they can lift the bridge up if you do not have enough tension springs. In conclusion, you always have to find out the information about the product before you decide to buy them carefully. Buying the guitar strings is not too hard, but it requires you to be careful and alert. This is just a tiny part, but it is important, you have to choose the right strings then you can focus on playing guitar and purchase your musical dream. I believe that you can do. I also hope that my article is useful for you when you have to make a choice for the best electric guitar strings. Stay cool!